The Dianich Gallery, 139 Main Street in Brattleboro, exhibits work by artists from Vermont and its surrounding region. The Dianich is pleased to be hosting, from May through July 30, 2016, an exhibit by Molly Hatch, a Florence, Massachusetts-based artist who grew up on a Vermont dairy farm. 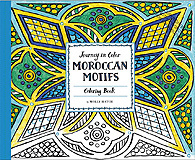 Molly is the daughter, granddaughter, and great-granddaughter of painters, and studied drawing, painting, printmaking, and ceramics. She received her BFA from the Museum School in Boston in 2000. After several ceramic residencies and apprenticeships in the U.S. and abroad, she received her MFA in ceramics at the University of Colorado in Boulder in 2008. In 2009, she was awarded the prestigious Arts/Industry Residency in Pottery at the John Michael Kohler Arts Center in Wisconsin, which laid the foundation for her career as an artist designer with many retailers worldwide. Hatch's work has been widely collected, commissioned, and exhibited at art fairs nationally and internationally. In 2013, Hatch had her first solo museum exhibition at the Philadelphia Art Alliance and was included in a contemporary decorative arts exhibition at the Museum of Fine Arts in Boston that same year. In the spring of 2014, "Physic Garden," a monumental 456-plate painting, was installed at the High Museum of Art in Atlanta. After first encountering Molly's work in the context of her numerous shows at notable galleries and museums, The Dianich is delighted to be bringing this local artist with regional and international recognition to Brattleboro. Molly Hatch is represented by the Todd Merrill Studio in New York City. Molly designed her newest body of work, entitled Passage, with the gallery space at The Dianich in mind—a space distinctively suited to sculptural floor pieces. While she is better known for hanging plates on the wall as paintings, Molly has largely focused Passage on sculptural objects displayed off of the wall; only two of the five pieces in the show are hanging. Featuring new ceramic sculptures and drawings, the inspiration for Passage comes from both historic and contemporary textiles and patterning found in home interiors. With an attention to pattern and understanding pattern repetitions, this body of work explores how patterns juxtapose. Stack I, Stack II and Stack III play patterns off of each other in the way one might find pattern combinations in a home, and they concentrate the eye on these juxtapositions, encouraging the viewer to see the patterns and colors in a new way. 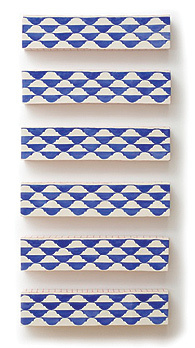 Wall Stack engages pattern similarly, juxtaposing a pattern on the side with a pattern from a head-on view, an optical play that encourages the viewer to walk around the piece viewing it from all sides—a three-dimensional painting. 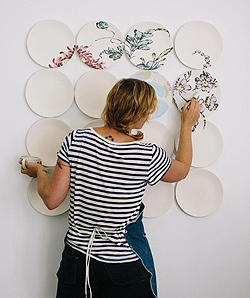 To bridge her past creative expression with the formation of this new body of work, Molly has included one small wall painting of sixteen plates titled Passage, which explores the geometry in pattern through the combination of a geometric contemporary block pattern and a historic 18th-century Chinese foliage pattern. A Gallery Walk opening reception is set for Friday, May 6, from 5:30 to 7:30 p.m. Other than receptions during each Gallery Walk, hours at the gallery are by appointment; call (802) 380-1607 or e-mail dianichgallery@gmail.com. The gallery website is www.catherinedianichgallery.com, with more information on Molly's work at toddmerrillstudio.com and the artist's website, mollyhatch.com. 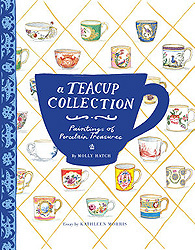 A Teacup Collection: Paintings of Porcelain Treasures—In paintings as pretty as the porcelain they depict, this gift book celebrates one of the finest teacup collections in the world: the 300-piece archive of the Clark Art Institute, which dates back to the eighteenth century and represents coveted designs of the day from Europe and China. Artist Molly Hatch, with exclusive access to this largely unviewed collection, pored over the details of each cup to create this visual treat. Including page after page of paintings of the cups, and led off by introductory essays, this is both an intriguing reflection on the art of collecting and an utterly charming gift for tea drinkers and teacup collectors. 120 pp. List: $16.95 — A set of 20 notecards is also available for $14.95. 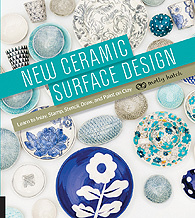 New Ceramic Surface Design—Molly's fully illustrated manual covers a wide range of creative surface decoration techniques in an approachable and accessible format. She guides beginners and more advanced ceramicists through various methods for creating designs on clay, including several different and new approaches for using their own imagery and content on the ceramic surface. Techniques include Mishima, tape resists, rubber stamping, and doodling to create line art, stamping, nature resists, found objects, and shellac resists to create textures, and sticker resists, contact paper stencils, paper resists, and Sgrafitto to create shaped designs. Detailed photography and hand-drawn illustrations document the processes and show beautiful completed samples. 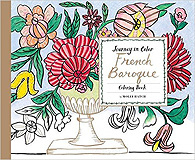 Templates and stencils for all the featured designs are included in the back of the book to use as is, or to tailor to your own tastes. Molly's online workshop Splendid Ceramic Surfaces is a great companion to the book—see http://mollyhatch.com/workshops/online-classes/. Ringbound, 160 pp. List: $29.99.